Details relating to the San Marino Commemorative of 2017. This coin commemorates the 750th anniversary of the birth of Giotto di Bondi. Giotto was a Florentine painter and architect of the late Middle Ages. His work, through its realism and handling of spaces had a significant influence on the Renaissance. His main work is often seen as the fresco cycle in the Cappella degli Scrovegni all 'Arena. 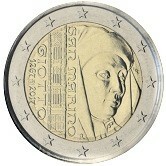 The inner circle of the coin is divided into two parts – on the left is a portrait of Giotto, looking to the right. The right side shows the impressive Campanile di Giotto and the inscriptions (all shown vertically) – SAN MARINO (to the right of the Campanile) and GIOTTO 1267 2017 (to the left of the Companile). The mini mark is at six o’clock and the mark of the designer is between two and three o’clock. Return from San Marino Commemorative 2017 to euro coin collector.